This project aimed to restore the woodland in the designed parkland and other areas of the Applecross House policies. This woodland has been the subject of extensive damage in the gales of recent years. Tree planting within the policies in the Victorian era was planned and managed meticulously. In recent years the budget has not allowed for the same woodland management or planting schemes and there was a danger that not enough new trees were growing to replace the old. This project sought to address this issue and work began with a survey of all the trees within the policies. A list was produced of all trees that were diseased or dead, and tree surgeons, Highland Tree Services were recruited to undertake the work. A planting plan was drafted, with tree planting phased over ten years throughout the policies. The most pressing areas were highlighted for immediate planting and Scottish Woodlands got to work. 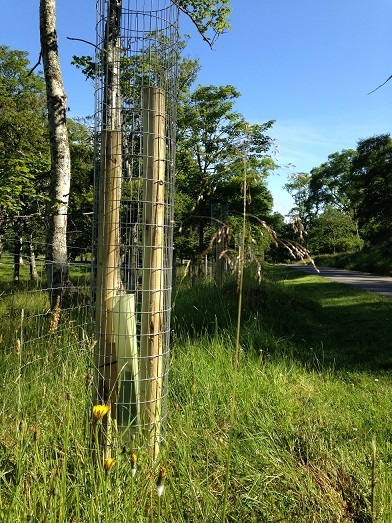 Whilst the Policies Woodland project does not have the budget to undertake all the tree surgery or all of the tree planting required, it has made a firm step in the right direction and the Applecross Trust has pledged to continue the planting scheme going forward. Four Trees of Applecross: as part of the Policies Woodland project, it was agreed that the historic Four Trees of Applecross would be planted in as spot as near to the original as possible. Four sweet chestnut trees were planted and a plaque telling the story of the four trees has been erected for visitors and locals to read.